When buying a Chilli Penguin stove, you are buying a quality, exceptionally efficient, made to order, top of the range, high performance, British designed and manufactured product with full back-up service available. The aim at Chilli Penguin is simply to do what they do really well. A small company, they do not mass produce. All stoves are made to order, they know every single stove that goes out of our door. Chilli Penguin want you to be completely satisfied, and are proud of the fact that they sell a lot of their stoves to customers who have received a personal recommendation from another customer. “The little stove with a big heart, stof fach gyda chalon fawr”, small but mighty, a flaming wood rocket, a tree fuelled engine. 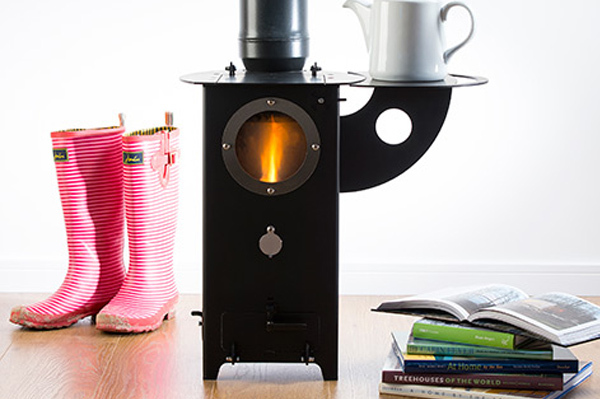 This little stove was developed during 2012 with Puki Pods, the camping pod manufacturer. It has been designed to be used in small spaces like camping pods, yurts, beach huts, shepherds huts, sheds and studios. It has not been tested for use in homes. It is top loading with a round glass window which you can see the fire through. You can boil a kettle on the top surface of the stove. The kW output is between 2.5-3kW. There is an optional detachable side shelf which is useful for putting your kettle or pans on when not boiling. The installation and safety guidance for installing a stove in any small structure is almost identical to that for a canal boat. It is vital that the distances from combustible surfaces to all surfaces of the stove and flue pipe both inside and going through a roof are strictly adhered to (see installation guide page) and smoke and carbon monoxide alarms are fitted. The stoves are painted giving a matt finish, the surfaces can be cleaned with a damp lint free rag. Please note the Almond paint does mark easily, we advise unpacking and installing with gloves on. Heavy marks or discolouration can be simply overpainted with the high temperature paint in aerosol form, which we stock (other products). These are the colours that are available across the product range. This stove has the same fire box as the Short Penguin but it has grown in height and girth. The Chubby has an integral plinth which gives it the additional height and side convector panels which give it the extra width. Big, fat and beautiful, when something smaller just won’t do. The Fat Penguin has all the features of the Hungry Penguin, it will warm you, feed you and make you a brew but the side convection panels make it wider. The output is still 5kW but this is a bigger, bolder looking penguin. The extra width means a bigger top plate so if you are cooking on it you will have more room. The side convection panels mean that the side surface temperature is cooler as it promotes air flow from beneath the stove convecting heat out at the top. The Fat Penguin is available with a glass oven door. With this option there is no separate ash door, the ash door is accessed via the main glass door. The big boy of the penguin family, cool, classic, contemporary, awesomely simple, simple awesome. This is 8 kW of warm glowing chilli-hot heat. The generous clear glass window offers a huge view of the fire and it takes logs measuring up to 430mm. It is also available with a plinth. There is a DEFRA kit available for the Penguin 8. With the DEFRA kit fitted the Penguin 8 can be used in smoke control areas. Small in stature but big on personality. The smallest and of our domestic stoves, equally at a home on land and on the water… a stove you’ll want to come home to. Clean lines, contemporary stainless steel handles, clean burning and very efficient. Equally popular at home and on canal boats. Simple, small, sensational… you can’t go wrong. The Short Penguin is available with or without a plinth. All our domestic stoves come with DEFRA conversion kit which can be fitted if you live in an area which is within a smoke control zone. The High & Mighty offers everything with its elevated height, oven box, log plinth and integral convection panel sides. 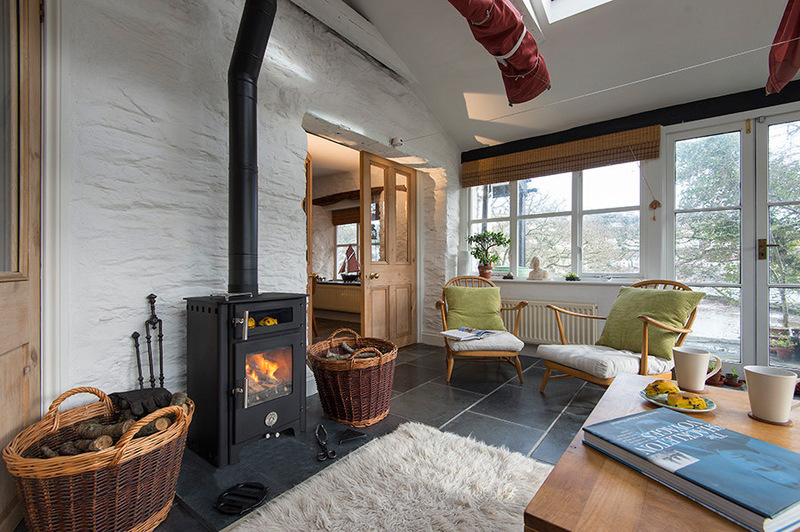 Woody is a 5kw multifuel stove with a landscape window offering a really generous view of the fire. It is our slimmest stove with a depth of only 285mm making it suitable for shallow fireplace recesses. The size of the firebox allows for a longer length log than many of our other models. It is also our most efficient stove. It reaches a remarkable 87% efficiency burning coal products and 82% efficiency burning wood. It utilises the same chilli penguin clean burn and air wash technology as all our stoves.